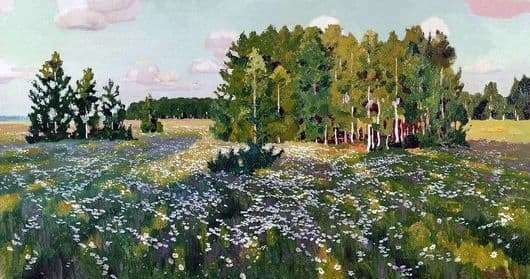 The famous Russian artist Arkady Rylov wrote in 1916 a unique painting “Flowery Meadow”. He depicted the early summer, when nature is only awakening and reborn after a long “hibernation”. The picture allows you to relax not only the body but also the soul. Looking at the beauty of the meadow, which is immersed in flowers, I want to plunge into this action with my head and forget about the time in which you are. Is this not the talent of the master, which allows a person to dissolve in their problems and enjoy life. The main characters of the picture are meadow herbs, which are presented in all their glory. They are clearly and delicately traced, on the one hand, it seems that they form a single whole, and on the other hand, on the contrary, everyone lives his own life. Among their diversity, wild flowers lurched timidly. In places, Rylov depicted trees for a reason, in nature, too, everything is natural, as well as in life. Due to this, the plot has a continuation and its own story. The artist used only light and warm colors to create a picture, they give the action calmness, lightness and serenity. Green is the color of life and harmony, yellow is the color of peace and unity, white and pink clouds add a peculiar flavor to the whole image of Russian nature. Looking at nature, it seems that it will last forever, summer will never end. Nature breathes simplicity, kindness and beauty, I want to run through the grass barefoot, gather a bouquet of fragrant wild flowers and nothing more to think about. Is this the happiness and dream of any Russian person? You can admire the picture for hours and dream, dream, dream. Everyone has their own dreams and desires, which may well turn into reality, if you think about it, reflect, believe and wait. The canvas can be seen in the Tver Art Gallery, you will be there, be sure to see the great creation of the master.